Translation from Revista Brasileira de Ciências Sociais, São Paulo, vol.18, n.53, p.111-129, Oct. 2003. This paper discusses the different meanings of formality and "informality," as well as the notions of legitimate work contracts. It aims at redefining the concept of "informality" based on the different principles that conduct the interpretations of economists, jurists, and the public opinion. Firstly, it presents a brief summary on the appearance of the "informality" as social problem; then, it criticizes the use of such concept, given the diversity of contractual situations included in it. It also points out the necessity of analyzing the popular notions of a "fair" work contract because the interpretations are related to economical and juridical notions of legitimate contracts. It finally examines the analytical difficulties on the theme due to the diversity of processes that generates relationships of "informality" in Brazil. It points out, then, the necessity of intensifying the academic dialog among economists, jurists, and social scientists, in order to better understand those atypical contracts. Key words: Informality; Work market; conomical-Sociology. Neste artigo discutimos os diferentes significados de formalidade e "informalidade", bem como as noções de contratos de trabalho legítimos. Busca-se redefinir o conceito de "informalidade" com base nos diferentes princípios que guiam as interpretações de economistas, juristas e da opinião pública. Primeiramente, faz-se um breve resumo do surgimento da "informalidade" como problema social, e, em seguida, critica-se o uso desse conceito, dada a diversidade de situações contratuais abarcada por ele. Argumenta-se, ainda, sobre a necessidade de se analisar as noções populares de contrato de trabalho "justo" por serem acepções que se relacionam com noções econômicas e jurídicas de contratos legítimos. Examinamos, por fim, as dificuldades analíticas do tema devido à diversidade de processos que geram as relações de "informalidade" no Brasil. Aponta-se, pois, para a necessidade de se intensificar o diálogo acadêmico entre economistas, juristas e cientistas sociais para uma melhor compreensão dos contratos atípicos. Palavras-chave: Informalidade; Mercado de Trabalho; Sociologia Econômica. Dans cet article, nous abordons les différents sens de la formalité et de l'"informalité", ainsi que les notions de contrats de travail légitimes. Nous cherchons à définir le concept d'"informalité" suivant les différents principes qui guident les interprétations des économistes, des juristes et de l'opinion publique. Nous proposons, tout d'abord, un bref résumé de l'apparition de l'"informalité" en tant que problème social pour, ensuite, critiquer l'emploi de ce concept, étant donné la diversité des situations contractuelles qu'il englobe. Nous rappelons, également, le besoin d'une analyse des notions populaires de contrat de travail "juste" car il s'agit d'acceptions qui ont un rapport avec les notions économiques et juridiques de contrats légitimes. Finalement, nous examinons les difficultés analytiques du thème dues à la diversité des processus à la source des rapports d'"informalité" au Brésil. Nous indiquons, donc, le besoin d'intensifier le dialogue académique entre les économistes, les juristes et les scientistes sociaux pour une meilleure compréhension des contrats atypiques. Mots-Clés: Informalité; marché de travail; Sociologie économique. "Informal" markets and "informal" employment contracts have been perceived in Brazil as an economic and social problem, since these expressions mean breaking up with a single (or almost single) contractual standard, that is, the "formal" contract. Underlying this idea there are two assumptions: (1) that a fair and well organized society should have only one type of employment contract (the "formal" one); and that (2) for such it must be based on a central organism (the State, through the Legislative Power) which defines the minimum legal standards for a labor contract. The more the "minimum legal standards" lack consensus, the more problematical the notion of "informality" becomes. Since the mid 90s, the notion concerning "minimum" has been subject to debate in Brazil, although expressed as "flexibilization". In fact, the meaning of the conceptual duo "formal"/"informal" isnt clear, and there isnt any cohesion on the pertinence of homogeneous employment contracts, neither about the role of legislation in the employment contracts. We argue that only after having identified the several types or groups of "atypical employment contracts" (a notion that would perhaps be preferable to that of "informality"), whether foreseen in the law or not, will we be able to define the inconveniences concerning the inexistence of a single contractual standard and, mainly, to identify the reasons for the existence of atypical and illegal employment contracts or contracts not foreseen in the law and socially illegitimate. The notion of "informality", although widely adopted by Brazilian Economic and Social Sciences refers to some phenomena which are too diversified to be aggregated into a single notion, as the international literature has been pointing out. The meaning of "informality" depends on that of "formality" in each country and period, and, although this is quite clear, the analyses on the theme tend to ignore the opposite notion from which it originates. Thus, the understanding of "informality" or atypical employment contracts depends, more than anything else, on the understanding of the formal employment contract prevailing in each country, region, segment or professional category. In Brazil, the popular understanding of "formal work" or "informal job" derives from the legal framework. Informal employees are those who dont have a "Carteira de Trabalho"  Labor Booklet. This booklet is a sort of a "labor ID." in which the employers are obliged to write down information about their wage, social security, hiring and firing dates and conditions, among others details. Therefore, the Labor Booklet tells the history of all formal jobs the worker has had and it is frequently used to show that the worker is a reliable citizen when he is hired for a new job or needs to get a loan, and that he deserves to be respected by the society. Until the recent changes introduced during FHCs government, the employment contract foreseen in the CLT  (the Brazilian Labor Code) for an undetermined period was virtually the only option available for private companies. In Brazil, "formal" had a single format, as opposed to other countries whose legislation foresees (and in fact, practices) part-time employment contracts, employment contracts which are specific for small companies, temporary employment contracts, etc. In Brazil, the recently established legal changes had a limited impact, either because they were largely inspired in the CLT standards or because of their limited application. At any rate, the contractual standards of "informality" are much more diverse and, notwithstanding, seldom discussed, except in studies about categories or specific informal segments. As opposed to the formal contract (in the legal sense), there are several types of "informal" contracts, such as those clearly illegal (or unlawful, as for example, slave labor), family labor, or several other types of employment contracts whose by-laws are frequently under dispute  for example, cooperatives or outsourced contracts. "Informality", however, is frequently treated as if it were a uniform, objective and measurable phenomenon. Not to mention that government planning and public policies demand objective and easy-to-use measuring methods (many times standardized to allow international comparisons) for contractual conditions, which greatly reinforce the simplification that the binary classification implies. 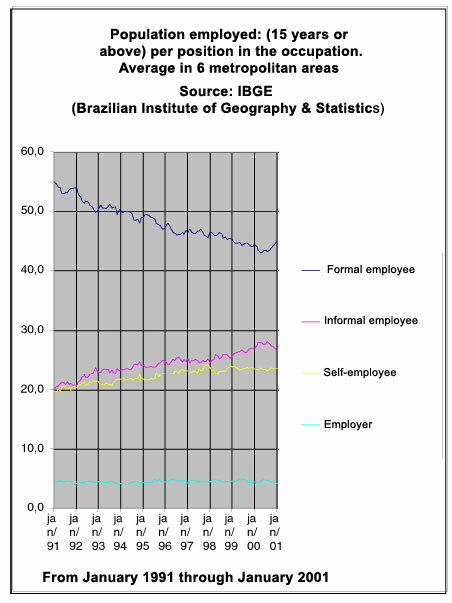 Assuming that these considerations are true, it is necessary to admit that the economic or sociological approaches based on the dual concept "formal/"informal" represent only a partial vision with limited power to explain the reasons why Brazil has such an extended history of atypical employment contracts and failures in its search for labor market homogenization. This article argues that the debate on "informality" has had very little progress, since most analysts continue to classify different phenomena under the same notion. Even those who detect the inadequacy of the conceptual opposing duo rarely present and discuss the diversity of contractual types and the respective forms of classifying them. Here we affirm that the notions of "effective" contracts according to Economics, and of "legal" contracts according to the Law, as well as the popular notion of "fair" employment contracts, can elucidate the contractual possibilities actually existing in the labor market better than those deriving from a cheer economic, juridical or sociological interpretation. Thus, the purpose of this article is, above all, conceptual. It is an effort to redefine "informality", based on the way through which economists, jurists and the public opinion understand it  this term is used here to designate non-specialist groups, but those which are directly involved or interested, such as employees, employers and their representatives. It is assumed that there is a conceptual dispute between several segments to redefine new notions of employment contracts morally defensible in Brazil. The lines of reasoning presented in this study are the initial result of a survey1 on the different meanings of "formality" and "informality" and the notions of legitimate employment contracts. The first part of the study presents a summary on the appearance of atypical employment contracts as a social problem; further we present an argument on the existence of three major grounds to approach the theme: (1) the economists with the opposition formal/informal; (2) the jurists with the opposition legal/illegal; and (3) the common sense with the opposition fair/unfair. Effectiveness, legality and legitimacy are the three dimensions underlying these constitutive principles of the employment contract. The second part presents a criticism to the prevailing interpretations of "informality", showing the diversity of contractual situations encompassed by the term "informal". Further we discuss the specifics of the "informal job" within the "informal market", as well as the principles distinguishing the activities carried out by the employee, the employer and the independent service provider. Based on the principles guiding the economic and juridical approaches to the theme, in the third part the article presents a chart containing six types of explanations about the phenomenon "informality", which upon emphasizing the origins of atypical employment contracts, prove to be more adequate to certain periods of time, regions and market segments. In the fourth part, popular notions of a "fair" employment contract are analyzed, up to the extent that they maintain reflexive relations with the economic and juridical notions of legitimate contracts. The fifth part discusses the analytical difficulties involving the theme in Brazil in view of the time and space overlapping the several processes that generate atypical contracts. Based on this picture, we point out the need to carry out interdisciplinary studies as a means to understand atypical contracts more clearly. Defining the issue: The meaning of "informality"
Below we present a brief summary on the history of the labor market in Brazil. At the beginning of the 20th century the labor market, as the term is currently understood, started to develop as the prevailing means for producing goods and services. During the first three decades, labor was transformed into a free-negotiable commodity, since laws and collective contracts almost didnt exist (see Lamounier, 1988). During the 30s and 40s, Vargas State cooperativism established a broad labor law code, which influenced the domestic market for the whole century. From then on, the notions of "formality" and "informality" were gradually established. Statistics indicate an extended process for formalizing labor relationships based mainly on federal laws and, only secondarily, on collective contracts. Labor law established in detail which the minimum rules for fair labor relationships were. The minimum salary; work load; annual vacations and many other rights were established by law. At that time, collective agreements played a secondary role in the process. Workers were also ensured many social rights - and here we mean formal workers - making up a typical occupational welfare.2. Public officers were the first to benefit from the formal employment contracts and, consequently, from the social rights associated to them. The urban non-industrial employees were gradually incorporated. Wanderley Guilherme dos Santos described it as the development of a "regulated citizenship", that is, a process according to which the several labor categories were entitled social rights (and labor rights as well) based on their position in the market. Among the large categories, one of the last to obtain "citizenship" was that of rural workers, during the 60s. Thus, particularly from 1930 on, the Brazilian labor market and the issues related to underemployment 3 or "informality" can only be understood as a result of the establishment of the notion of "formality", which, in turn, is associated to the notion of citizenship and social rights. In the 70s, the profile of the labor market was clearly dual: most industrial workers had been incorporated into the formal market, and so had a substantial portion of the workers engaged in the services segment. In addition, the simultaneous urbanization process reduced significantly in just a few decades, the number of rural workers who were basically engaged either in the "informal" market or in other semi-contractual-traditional relations, such as family labor, in subsistence economies. Urbanization and industrialization also contributed to enlarge the mass of underemployed workers, poorly incorporated into the labor market. The peculiar institution of the Labor Booklet had several symbolic and practical implications. For a long time it worked (and to a certain extent it still does) as a true identification card or a way of granting consumer credit: it was a cogent evidence that the person worked for "sound organizations", that he/she was "reliable" or capable of remaining with the same company for many years. Today, it means that the employer has the moral obligation to comply with the labor legislation, although in fact there is no guarantee, since the employee can actually cheat the legislation, even though those who do not sign the Labor Booklet may be sued. In any case, having a Labor Booklet makes it easier for the employee to prove the existence of a formal employment commitment. In short, in Brazil, having a "formal job" means having a Labor Booklet. Until late 1980, most specialists perceived "informality" (or underemployment) as an endemic problem. However, the changes that had taken place in the previous decades led experts and politicians to foresee (and even wish) an impressive reduction in the "informal" market. It was generally assumed that "informality" (or underemployment) was a legacy from a semi-industrialized economy, whose ending was only a matter of time and development. Nevertheless, in terms of the labor market, it does make sense to assume that the beginning of the 90s represented a rupture with the increasing movement towards job formalization. Since then, "informality" has increased. The ratio of employees without an employment contract increased 8.1%: from 20% in January 1991 to 28.1% in January 2001. At the same time, the ratio of employees having an employment contract decreased 12.8% (Chart 1). Such increase probably represents an overturn in the history of an apparently safe path towards an egalitarian labor market. Nevertheless it could also be a result of Latin Americas poor macroeconomic performance in the 90s, or yet a result of the quick economy internationalization. Many countries have undergone similar mutations. For some analysts, it has to do with a new batch of atypical contracts which do not comply with the standards of a "salaried society" (see Castel, 1998). New job processes and technologies would demand new contract models. And the new "informality" would then derive from such changes (these interpretations will be discussed in the third part of this article). In Brazil, sometimes "old" and "new" atypical activities seem to be mixed, making it still more difficult to identify the causes for their recent increase. The incorporation of several segments into the formal market was still underway when "new informalities" emerged  (these opposed notions will also be discussed in the third part of this article). Moreover, the simultaneous increase of atypical contracts in several countries reinforces the assumptions of those who consider that these contracts result from the growing international market competition. The countries in the vicinities of the international market would suffer the consequences of being the fragile link between the international productive chains (Gereffi, 1995). Their competitive advantage is the low labor cost, which leads developing countries to compete among themselves. It isnt our intention to measure the "old" and the "new" "informality", but to discuss a theme that is previous to this evaluation, that is, the different meanings of "informality" as opposed to the word "formal". If it is true that this notion has acquired a clear meaning, this was due to the economic approach that linked "informality" (that is, underemployment) with non-profitable peripheral activities. The colloquial use of this term in Brazil, however, concerns the legislation: the job is considered a formal job if, and only if, the employee has a Labor Booklet or if he/she is registered as a free-lancer or has the status of an employer. The third interpretation is that adopted by jurists: in essence, there are no "formal" or "informal" contracts, only "legal" or "illegal" ones. In fact, the existence of a register substantiating the status of employee, employer or free-lancer is a parameter of undisputable importance, not only because it makes it easier to measure their situation, but also because of the legitimacy of the CLT, which can be observed through its paradigmatic role in the definition of a "good employment contract". Thus, there are three different sources for interpreting the phenomenon popularized by the economists and by the media as "informality". The first is precisely the economic interpretation. Magistrates and proxies, in turn, due to their own professional ethos, classify as "illegal" most situations which economists understand as "informal". Under the influence of both (as well as of research institutions), the population tends to identify "informal" with the absence of a Labor Booklet and, consequently, "unfair". We can see that there are three contrasting pairs of notions through which employment contracts are perceived: formal and "informal"; legal and illegal; fair and unfair. Although "informal" tends to be identified with "without a Labor Booklet" and this with "unfair", adherence to such notions isnt linear. Below we will see how rich the combinations between them can be. Criticism to the use of the notion "informality"
We dont intend to discuss the extensive literature on "informal" employment or "informal" economy. The literature on this subject has undergone several reviews 6 since the first reference to this phenomenon was made on a research carried out in Africa by ILO. The term "informality", despite the several attempts to purge it, is too polysemic to be used without any adjective. The ambiguities of the notion arised from its very origin, which isnt strictly academic, but also institutional. The term was coined to depict a society which wasnt typically urban and industrial.7 Notwithstanding, it has been used to describe a broad range of urban-industrial situations, as well as to classify and measure them by means of diversified methodologies adopted by national and international institutions dealing with statistics. If we accept the idea, widely known among socio-economists, that the market is always institutionalized either by law, by collective agreements or and by social practices (which are also full of implied rules), why should we refer to market "informality?" Unless we understand "informal" as "without written rules", the market will always be considered formal. Why should we need the dichotomy (formal versus "informal"), if it could be better expressed by "legal"/illegal", or by "written contract" versus "verbal agreement"? First of all, we believe that the "informalities" concerning work should be distinguished from the "informalities" regarding other contracts of the economy, and second we should pay attention to the instruments necessary to distinguish the juridical and contractual status of the labor rules, as well as their legitimacy. It is not our intent to present an extensive list of situations we only intend to show the various types of reality described under the same notion. Such examples include activities which arent exactly economic activities, free-lancer activities, service provisioning contracts for customers and companies, and several other kinds of labor contracts not foreseen in the legislation. We also do not intend to define notions which cover all the situations mentioned we will discuss the urban labor market. This restriction aims at avoiding the complexity of the traditional rural work relations, at least at the beginning of the research. We will be limited to the "salaried society" and the post-salaried society, leaving behind other traditional ways of dependence regarding the contracting party. We will also leave out some types of "informal" labor, as they arent exactly economic activities  they would be better described as semi-economic activities. For example, activities which fit within a mix of a hobby and a handcraft (knitting, painting, collecting rare coins, etc.) or which are linked to traditional family standards (renting a spare room to a friend) or temporary and opportunistic activities (a student, for example, who helps a fellow with a given discipline and who, in turn, is helped by this student in another discipline, or in exchange for money), and many other semi-economic activities where the monetary gain represents a residual ratio in the individual income or in terms of motivation for his/her action. The limits between these semi-economic activities and economic activities cannot be easily observed in empirical terms, but in theory they can be defined as those (a) irrelevant in the viewpoint of the public fiscal budget and (b) socially perceived this way  for example, everybody considers fair that such activities be exempt from taxes. These activities arent questioned either by the economist or by the jurist or the ordinary citizen. They are found both in traditional and post-modern societies. In fact, they constitute a type of phenomenon that proves that it is impossible to have a complete monetization of social life. The traditional distinction between employee and free-lancer, as well as between free-lancer and employer, is based on the degree of subordination or dependence. The first usually works according to rules defined by the employer; is paid per hour worked (not per task or production); has relatively clearly defined working hours and must be available and subordinate to a single employee during the hours agreed. These characteristics vary depending on the activity. The "ideal type" of salaried employee, which adds up all these characteristics, seems to be disappearing for several reasons: mainly because of the economic and administrative changes in the entrepreneurial world. On the other hand, while the number of typical employment contracts decline, jurists have been trying to update the notion of "employment" contract by defining a set of characteristics which are meant to distinguish the employment contracts from the service ones.13. This happens not only in countries having a legislated tradition (or corporativists) but also in those having a contractual tradition (or pluralists). Discussing the British legislation and juridical tradition, Pitt (1995) opposes the contract of service (employees) to the contract for service (free-lancers). At any rate, the principles of dependence and subordination, 15 as guides for juridical and sociological definitions of these three categories also clearly indicate the distinction between the employment contract and the contracts between companies, where no subordination is implied. The moral commitment observed by Portes (1994) between Dominican entrepreneurs, illegal migrants working in the United States, could not occur among North-American citizens in terms of subordination (and non-contractors having the same status) in an urban labor market. If it werent for the condition of illegal migrant, the commitment to shared "informality" (or illegality) would last only while a labor relationship existed. In Brazil, the number of "informal" ex-employees suing their employers when fired serves to exemplify the limits of a previous "informal" agreement between uneven contracting parties. The permanence and reproduction of "informal" contracts seem to depend on two variables: the previous relationship existing between a group of people having an inferior social status or being stigmatized, and the perception of a certain "contractual" equality, which would prevent one party from suing the other party due to their former relationship. In large cities, in "informal" employment contracts the parties share an illegal condition, but within a subordination contract. Thus, the dependence and subordination relationships are key variables to distinguish the types of "informal" labor. Upon limiting our object to "informal labor", some conceptual issues could be avoided. However, many of the issues discussed still remain. At this point of our analysis we aim to identify three main types of approach to the phenomenon, each one appropriate to explain a specific type of atypical employment contract. "Old informality" tried to explain the market of an economy in transition, which started to generate a mass of unemployed and underemployed people who quickly crowed the industrialized cities, coming from rural areas. This was the scenario in the 60s and 70s. In Brazil, the "neoclassic" approach was spread at a different moment, later than in other countries, that is, at the end of the 80s when labor rights were reinforced by the new Constitution and, at the same time, intensified the international trade. The "post-fordist" analysis emerged in Brazil at the beginning of the 90s, but unlike the other approaches it is more adequate to explain the (an even the labor class) "informality" of the middle class than the "informality" of the lower classes  peddlers and the similar. For each of these approaches we find similar perspectives in terms of diagnosis, but quite different with regard to their assumptions and implications because they bear more explicit normative purposes. The approach of "old informality", although clear and consistent, can easily generate fragile interpretations, such as, for example, those which identify "informality" with precarious work.19 . In countries having major regional differences and facing quick social changes, including migratory flows, it is quite hard to distinguish the "informal" work deriving from the traditional "informality" economy prevailing in large cities, from activities at the same time modern and poor, which are typical of recently deteriorated capitalist relations. This might explain the adoption of this version of the notion by several Brazilian social scientists. Counterbalancing the "neoclassic" perspective there is a "juridical" approach, which leads us to opposite conclusions despite some similarity in their starting-points, i.e., both perspectives focus on the regulation of the labor market. However, they differ according to the way they understand the causal relations between the market and the law. The neoclassic version sees the excess of regulations as the main cause to the expansion of "informality". On the other hand, the juridical version blames the public sector for failing to ensure compliance with law20 in face of the market power. The first wants to avoid the market failure due to the power of law; the second wants to avoid the failure of law due to the market power. On the other hand, the "juridical" counter argument is strong, in the sense that labor right is the source of social right in Brazil, not the other way round  this means that any possible deregulation could have significant social impacts. In addition, the debate about "the end of work" (or less emphatic variations, such as "post-industrial work") has a substantial symbolic effect on the middle class, that is eager for a vision that could explain its own unemployment or underemployment, despite the questionable real dissemination of substantially new and different labor relations. This is the complexity of "informal" labor in Brazil: all approaches have at least one good line of reasoning. Perhaps the least consistent (although often adopted) is the approach of "poor informality", given its theoretical fragility. Nevertheless, in Brazil the main debate moves around the axis "neoclassic" versus "juridical", since the concept of employment contract is firmly rooted. In any case, if this classification of types of approaches proves to be adequate, we believe that today the task to be performed by empirical research is to identify, per sector and region, the several types of "informality", and evaluate their relative weight. The picture of "informal" labor couldnt be complete without the understanding of the common sense 22 regarding employment contracts. By nature, the popular perception is not planned or coherent; neither does it have a well defined purpose. Thus, we cannot attach to it the intention of creating a logical set of notions to classify the types of employment contracts. Their notions are dialogically and diffusely built, but strongly influenced by the specialized notions of jurists and economists that are disseminated by the media. In democratic societies the law must be, by definition, just and justifiable. In case it isnt, it is apt to be changed, but never ignored. Nevertheless, many employment contracts considered fair by some groups arent legitimated by law or are clearly illegal. In Brazil, the typical "informal" job can be understood if not as "fair" at least as "acceptable", and it certainly isnt considered "illegal" unless it configures a crime (generally, the trading of illegal products) and not just an illegitimate contract. Thus, in the popular viewpoint, legal contracts (with Labor Booklet) oppose to "informal" ones (without Labor Booklet), and not to the illegal ones23 (understood as unlawful), which denotes the influence of the two concurrent classificatory systems of the economy e the law. Both employment contracts, that is, the "legal" or the "informal" (with and without Labor Booklet) can be understood as legitimate contracts. The choice or acceptance of either one demands a complex evaluation, which includes the concept of law, fairness, ethics, and personal convenience. Thus, upon choosing or accepting a job, there is a set of considerations to be made about legality of the contract (hence the conceptual duo legal/illegal), and, more frequently, about its fairness (fair/unfair), its adequacy and the personal convenience (acceptable or unacceptable contracts independently or regardless of its fairness or legality). Moreover, people make considerations about ideal contracts or absolutely unacceptable contracts, not only based on their personal viewpoint, but also the social viewpoint. The lines that set apart "ideal", "fair", "acceptable", "personally unacceptable", "unfair" or "socially intolerable" are subtle, and mix notions related to personal needs, effectiveness, personal and family ethics, fairness and values, norms and socially defined habits (many of them having a traditional nature). A job can be acceptable but unfair, or unacceptable for an individual, but socially considered "fair". The duo "fair" and "unfair" refers to the public sphere, whereas the notions "ideal", "acceptable" and "unacceptable" refer to individual preferences. The notions of public fairness affect individual preferences, but do not define them on a linear or mechanical way. A verbal "informal" contract can be understood as "fair" if the employee perceives that the employer has good reasons not to regularize the situation (for example, a small company undergoing financial difficulties).24 . On the other hand, the more the employee perceives that "informality" is a means of generating an extra return to the company, the more "unfair" will the contract be. Although the perceptions of fair and unfair, acceptable and unacceptable are based on a broad set of moral and ethical values, two general principles make up the basic dividing line between fair and unfair. First, not having the same rights as other employees occupying similar positions in the company 25; second, realizing that the employees extra gains are achieved by limiting the employees rights. A quite different situation occurs with the "informal" contracts of service providers, which do not imply the loss of labor rights nor benefits for the contracting party at the expenses of the contracted party. Through "informality", both of them benefit at the expenses of the public sector, since neither one pays taxes. However, this over-simplified line of reasoning cant be sustained when the service provider is identified by its profession, work condition or social condition with registered employees and thus, members of mutual systems of risk compensation. In this case, the advantages and safety provided by a formal employment contract become more attractive than the freedom enjoyed by the service provider. Thus, the limits between the "informal-fair" and the "informal-unfair" contracts depend on the perception of who will lose in case of non-compliance with the law, as well as on the notion of minimum rights, and on the attractiveness that the solidary system implied in the contract represents. There is evidence which allows us to suppose (something to be confirmed by further research) that the popular notion of an "ideal" labor contract is strongly influenced by the labor legislation. Citizens living in urban centers have as a parameter of ideal the job in which they have a signed Labor Booklet; alternatively, and more intensely, they dream about an independent job, but almost never with an "informal" labor contract. The concept of "ideal" varies from the safety of a labor contract (whose inconveniences are the associated obligations) to the freedom enjoyed by the free-lancer  a risky activity, particularly for non-professionals.26 . Among these two "ideals", many atypical employment contracts are perceived as "acceptable", that is, neither "ideal" nor "unacceptable". Nevertheless, for a contract to be "acceptable" it has to ensure minimum rights, which are usually inspired in the labor legislation, such as the 13th salary, transportation vouchers, and annual vacations. A legal contract (with a signed Labor Booklet) tends to be viewed as fair, but only in a few situations illegal contracts are (without Labor Booklet) perceived as unfair. This implies a curious dissociation which demonstrates the role of the CLT in Brazil, that is, a legitimate labor code capable of influencing the practices of the "informal" contract and, at the same time, incapable of establishing the minimum parameters that guide the legitimacy of labor contracts. CLT has defined the parameters for a good labor contract, but was incapable of defining the unacceptable contract. Moreover, what the employee understands as acceptable isnt much different from the employers perception as we could be led to believe by the approaches which overestimate the conflict capital vs. labor, or those which see the players as conscious maximizers of their preferences. Both employees and employers assume, either consciously or not, a minimum set of rights and benefits in specific segments of the market job in each region. The differences between these perceptions are probably greater in a comparison between regions than between employees and employers in the same municipality and category. Although the idea of "socially acceptable" doesnt correlate with "fair" in view of the pragmatic submission of individuals to the labor market reality (expressed by the sentence a job is never fair, but thats how life is), the idea of the socially unacceptable tends to be close to "unfair". Thus, to understand the way "the ordinary man "faces the conflict between the juridical approach (illegal versus legal) and the economic approach (informal versus formal) it would be more appropriate to investigate the notion of "socially unacceptable "than any other term mentioned above. A job can be unacceptable for a person due to many factors, such as the tasks required (for example, activities which are below the qualifications arent welcomed by the employees, particularly those considered "degrading"), the work environment conditions (for example, a dirty or unhealthy environment), or interpersonal relationships (an authoritative boss), among others. In addition, the perception of illegality or unfairness implied in a given type of contract varies according to the local common practices. Exploitation of children labor, for example, can be popularly seen in Brazil as illegal or just "informal", or sometimes not even recognized as a job (and thus, as a problem), depending on the cultural and economic variables prevailing in the region. The minimum rights and benefits that make up a "fair" or "acceptable" contract vary according to the place, the contractual standard prevailing in the region, the individuals previous professional experience and that of his/her family; it also has to do with the professional expectations which, in turn, are defined by many other elements comprising the individuals background, including variables such as degree of education, gender, and age. A quick transition from the "old informality" to the "informality resulting from globalization"
Below we are propose an analysis, although summarized and not in-depth, on how the recent transition process of a labor market in a poor country like Brazil took place. Comparatively, Ceará is a small and poor State, where a substantial portion of the population still lives from a subsistence economy and, many times, barters goods without any monetary reference, despite the fact that Fortaleza (and many other municipalities) is a modern tourist city with a large formal labor market. At the end of the 80s, the State government launched a program to attract industries and develop the local economy. To do so, two main incentives were created: first, fiscal incentives for the installation of intensive labor industries; the farther from Fortaleza the industries were installed, the more substantial the incentives would be. The fiscal incentives aimed at the installation of industries in drought regions of the State. The second attractive aspect was the permission to create "cooperatives" through which the workers would sell their products (mainly shoes) to exporting companies. The state government encouraged the establishment of such "cooperatives" only for exporting industries, arguing that the reduction in the cost of labor was the most effective way to face the international competition for products that required intensive labor. As soon as the proposal was implemented, the state unions started to denounce the "new cooperatives" as "fake cooperatives" and, despite the uproar created around the theme,29 , as time went by it became clear that the large majority of cooperative members were, in fact, employees of exporting companies. Labor inspectors,30 labor public proxies 31 and magistrates32 collected evidence and presented their reasoning. Currently, there are legal actions (already executed or underway) which aim at transforming the "cooperated" workers into workers subordinate to the CLT. In the public debate, the State government and exporters joined efforts in the defense of "cooperatives" based on economic reasons, but, indirectly, they admitted the legal inconsistency of their reasoning and started to propose a change in the domestic legislation. They argued that part of the population benefited who from the program had never received any remuneration that the life standards and life conditions of the local populations had improved considerably, that the installation of industries in these regions would have never occurred without such incentives; in short, eliminating poverty would be more relevant than complying with the law. During the first years of the program, the labor inspectors from the local DRT  Delegacia Regional do Trabalho (Local Office for Labor Inspection and Arbitration) didnt interfere with the "new cooperatives"  for the initial purposes of this discussion, it is irrelevant if this was due to negligence, laxity, collusion or simply because they werent requested to do so.33 Later on, denunciations from unions and proxies (many times discreetly applauded by entrepreneurs who werent favored by the "cooperatives") led the local inspectors to notify the companies and the Ministry of Labor. "Cooperated" workers soon understood that the arrangement violated the law. The feeling that they had been "blessed" by exporting industries in the middle of the dry hinterland , coupled with the fact that they had seen an increase in their purchasing power was, in a period of 10 years, replaced by the feeling that they had been deprived from the rights that were available to most Brazilian workers. People who until the end of 1980 had been used to "old informality" experienced, in the following decade, the "globalization informality" (and many said that they were satisfied and grateful for that34) and now feel harmed for being in a illegal situation  the "juridical informality", facing entrepreneurs and governs concerned about the "neoclassic informality". In view of the complexity of the subject proposed in this article, we dont believe that a conclusion would fit; we just want to suggest some points to make the debate on informal or atypical contracts a bit more productive. In a country where some regions are still facing the transition from a subsistence economy to a modern and urban economy, any notion of a legitimate employment contract is subject to quick and continuous mutations, which potentializes the provisional character of any empirical research on the theme. Brazil isnt the only country where notions of lawful, fair and acceptable are constantly changing; particularly in a period like the one we are facing, where the economy and the ideological international scenario brings to the table new notions on employment contracts. At these moments, the discussion about the legitimacy of contracts (which derives from the popular notion of "fair" or "acceptable" contracts) cannot be blurred by traditional debates in the sphere of the law and the economy, on the legality and economic efficiency of the contracts. It is exactly the opposite: in order to understand the phenomenon of "informality", that is, of atypical contracts, it is essential to grasp what escapes from the understanding of economists and jurists, that is, the balance between the notions of efficiency and fairness developed by the parties of a contract. We suggested here that the subject has been approached in a too generic way. Underemployement, informal labor, precarious work or "precarisation" (in French) are expressions possibly useful to describe generic situations or processes that highlight certain periods or regions, but which arent sufficient to understand the range of atypical contracts. That is, those contracts of the private sector that escape from the legal standard contracts ruled by the CLT, in the case of Brazil. The diversity of reasons why the CLT isnt respected cannot be restricted to any specific factor. The neoclassic explanation, apparently so robust, isnt able to solve the problem concerning the legitimacy of law throughout time. It lacks proper tools to explain the reiterated practices which are frequently reproducing outdated contractual standards. And it couldnt be different. New contractual standards are born from old ones and, in this sense, are an excellent laboratory for normative creation. Due to its magnitude, "informal" labor (without an employment contract) is a social and economic problem in Brazil; on the other hand, formal labor is also deeply rooted in the country. In Brazil, the employment contract is provided by law, more than the collective contract. Magistrates performing in the area frequently criticize the detailed Brazilian legislation, but most of them dont want that the principles underlying the notion of "employee" are abandoned, particularly the notion of subordination. Economists (and here we mean the neoclassic mainstream) try to abstract the labor legislation and propose a broad "deregulation" program, but their proposals face the "burden" of a model of non-contractual labor relations in which the condition of "salaried employee" is the basis for citizenship. With this, they take the social citizenship out of the contractual sphere, without transferring it to other spheres. On a reactive way, union members try to maintain the set of constitutional rights and those of the CLT. However, to impose their arguments they need proposals that could eradicate the endemic "informality" without compromising the economic performance. The local politicians can compromise with entrepreneurs who violate the law, whether viewing electoral interests (Tendler, 2002) or encouraging the creation of new contractual standards, but they live in a federate State where the labor law has always been unified. Thus, they crash against a theme out of the agenda, that is, the establishment of independent labor laws for each state. The labor legislation is a national reference. Thus, despite the practices, traditions and regional realities, the popular notion of "fair contract" has been influenced by the national legal principles, quickly assimilated by the populations and, also, by the notion of efficiency that the market has imposed with the increase of the national and international competition. From the empirical viewpoint, the challenge is to construct a contractual typology capable of depicting and explaining the different reasons that lead to non-compliance with law. It is in this sense that the predominant approaches to informality fail. Radically concurrent interpretations as those that we have presented are less compatible than they seem, as each of them depicts the reasons and origins of certain types of atypical contracts. If the assumptions supported in this article are correct, the public policies aiming at reducing "informality" (illegal contracts or not foreseen in the law) will have to act on a selective way according to the types of "informal" jobs encountered, and for such, the empirical task of defining and dimensioning the several types of atypical contracts will have to be accomplished. 1 It refers to the research "A 'Informalidade' e os Contratos de Trabalho Legítimos segundo a Economia, o Direito e o Senso Comum" (The Informality and the Legitimate Labor Contracts According to the Economy, the Law and the Common Sense), sponsored by Fapesp since May 2002. This research involves five subprojects and relies on the collaboration of graduating students and post-graduated researchers. I would like to thank particularly Antonia Celene Miguel and Karen Artur for their contribution to the research, as well as the graduating students engaged in the effort. 2 Ferrara (1993, cap. 3) distinguishes two Welfare States: occupational and universal. France and Sweden are, respectively, the most representative of each of these models. Germany, Austria and Belgium are also classified as "occupational". Other countries, such as Switzerland, Italy, the Netherlands and Ireland, are considered mixed models. 3 Until the beginning of the 80s the phenomenon today identified as "informal" job was classified mainly as underemployment. For an extensive analysis depicting the economic debate at the time see Hoffmann (1980) and Jatobá (1990). Each notion is more adequate to a type of labor relation, but both have been used in a relatively indiscriminate way, and with feebly defined limits. At any rate, the utilization of the term "informality" has been, superseding the term underemployment since the mid 80s, as the latter would be one of the forms of "informality". This issue will be resumed in the second part of this study. 4 Average of six metropolitan areas (IBGE-PNAD). 5 These data contest the prevailing idea that the "informality" was (or is) predominant in Brazil. Although this isnt the focus of this article, it is worth pointing out the distortion promoted in the media concerning the meaning of the data. 6 For a literature review, see Jatobá (1990), Tokman (1990), Mesa-Lago (1990) and Cacciamalli (1983). 7 Mario Theodoro reminds the peculiar history of the term, created by ILO and disseminated among the academic community and research institutions. 8 In the original: "[...] the extent to which such opportunities (to profit from 'informal' activities) are transformed into 'informal' enterprises depends on the capacity of communities to mobilize the social resources necessary to confront state enforcement and ensure smooth market transactions". 9 Harding and Jenkins (1989) criticize not only the use of notions correlated to "informal", such as subterraneous or hidden economy, but also the dual and tight form to define such markets. 10 According to ILO, many countries (21 out of 54) define the "informal economy" when the company isnt registered, and as " informal job" the one offered by such companies (International Labour Office, 2002). 11 The examples are inspired in the several "informal" situations which we have detected in the research referred in Note 1. 12 Based on data included in Celine Claros PhD paper, currently undergoing final editing. 13 This is one of the concerns that motivated the debate between Alan Supiot and several researchers, which resulted in a reference work (Supiot, 2001). 14 In fact, so far the research hasnt raised any empirical evidence about that. The statement is based mainly on the juridical doctrine, rather than on judgements by the Brazilian judiciary. 15 Uriarte and Alvarez (2001) discuss the extent to which the notion of subordination as a basis for labor law would have been outstripped by new organization practices, new technologies and a new notion of work. Their analyzes and conclusions, however, do not point to any principle that replaces it. On the contrary, the authors point to the possibility of broadening the scope of labor law (and, therefore, the notions of de tutelage and subordination) to all forms of human labor. 16 The best example of this approach can be found in Hoffmann (1980). But almost all social scientists and economists who approached theme usually considered underemployment as an important component of the "informality". 17 It cant be said that the Brazilian economists have a particular interpretation of the neoclassic approach. However, Pastore (1994) is the author most frequently quoted by economists who criticize the labor legislation. Other authors, though, such as Amadeo and Camargo (1996), adopt this argument on a secondary and complementary way. 18 Perhaps no other Brazilian author can be clearly identified as a representative of this thesis, but in several works it appears as a relevant component of the explanation for the recent increase in the "informality". 19 Barbier (2002) carries out a critical analysis of the use, for scientific purposes, of the term "precariousness" in France. The author points the existence of several meanings for the term throughout the last thirty years. In addition, his article allows us to perceive the specifics of the notions and the academic terminology concerning atypical contracts in each country, since the author was motivated precisely by his perception of the specifics of the notion around the term precarité in France. 20 Two good examples of interpretations which show the "structural anomie" of the Latin American countries to make the governmental institutions (including the law) operate are Malloys (1993) and Santoss works (1992). But their analyzes dont deal with labor markets, but with States. Some analysts of the theme, such as Camargo, Amadeo (1993) and Noronha (2000), try to avoid unilateral explanations either for or against regulation, but in Brazil the academic debate is still quite restricted. 21 The positive trend has Rifkin (1996) as his most popular representative. In addition to him, the regulation school, upon emphasizing the ruptures with the post-fordism tends also to highlight new job standards. The same is valid for authors who discuss the ruptures of the modernity, like Giddens (1990). In Brazil, we dont believe that there is a typical representative of such trends. However, based on several assumptions and concerns, researchers from the network "Labor and Society" of the National Graduated Association of Social Science (GT "Trabalho e Sociedade"  Anpocs) have produced, along the last years, several works about technological and administrative changes. Recently, Nadia Guimarães and Scott Martin gathered in a book studies about international competitiveness, social rights and development (2001). With other assumptions and concerns (valuation of entrepreneurial drive versus stability of the old manager) Roberto Grün (2000) discusses the ruptures in the form according to which the middle-class perceives job relations. Another theme that has caught the attention of researchers in this area is the corporate systems proposed by the solidary economy (see Singer, 2002). None of the authors, however, considers the several changes pointed out by him as exclusively positive or negative. The negative trend is better represented by some authors inspired in the Marxism, which tend to emphasize the destabilizing factors posed by globalization on the contractual practices of the labor market. Among the economists working in the labor area, Dedecca is one of the fiercest critics of the effects of modern capitalism upon labor markets (1996). 22 The expressions "common sense" or" popular view" as used here to refer to non-specialized interpretations of formality or "informality", that is, basically we have excluded the interpretations of jurists and economists, but have included in the common sense the interpretations of employees and employers in general. 23 We dont intend to measure the amount of illegal work in Brazil in the sense of "unlawful", as there are no data available. But we know that the unlawful activities represent a minor portion of "informality" in Brazil. 24 All the examples presented in this part are based on interviews carried out along the research already mentioned (Note 1). 25 Elster had already identified the principle of fairness in The cement of society, 1989. 26 Data from Sebrae, analyzed by Elson Pires, show the large proportion of small companies that closed their doors after less than one year of existence (Cebrap and Desep-Cut, 1994). 27 Based on data included in Celine Claros PhD paper, currently under final editing. 28 In the original: "the idea of satisfaction [explains] some individual decisions better than maximizing, such as when workers take the first available job that meets their minimum expectations [...]". 29 Law 5.764, issued in 1997, established the regime of cooperatives, and was changed by Law 8.949, issued in 1994. Such change aimed at creating jobs and was supported by a large part of union members. However, the proliferation of denunciations about fake cooperatives led many people to denunciate them as inconstitutional. Currently, there are projects at the National Congress either to change or revoke such law. 30 See enterviews carried out along the research "Desenvolvimento e upgrading de cadeias produtivas e relações de trabalho: a cadeia de calçados" (Development and upgrading of productive chains and labor relations: the shoe chain) (Ipea), developed by Eduardo G. Noronha and Lenita Turchi. The report on the case of Ceará is based primarily on this research. 31 See article by José Antonio Parente da Silvano in Diário do Nordeste, . 32 See article by Almir Pazzianotto Pinto in Correio Brasiliense, 6/4/1997. 33 DRTs inspectors have the right to act after (1) denunciations made by workers or unions and (2) action program defined by the Ministry of Labor and Employment (Mannrich, 1991). 35 We assume that the notion of "subordination" remains as the main axis in the distinction between provision of services and labor contract, despite the fact that many labor contracts have been transformed into service provision contracts through outsourcing, and despite administrative speeches that reinforce the notions of partnerships between employees and companies. That is, in spite of the real changes and the speeches about the condition of employees subordination, we believe that the large majority of labor contracts continue to bear several of the characteristics that define subordination. 36 As a matter of fact, MTE  Ministério do Trabalho e do Emprego, (Ministry of Labor and employment), has changed its inspection practices, trying to make them more effective and less punishing. Anyhow, this statement is still to be proven, and will be object of another article based on this research. 37 In the field of political sciences or economic sociology, several analyses of the literature reinforce this idea, which is present both in the "old" and the "new" institutionalism". See, for example, Dimmaggio and Powell (1991), Thelen and Steinmo (1992), and Scott (1995); particularly for the relationship between laws, norms and markets, see Suntein (1997). * In countries in which collective contracts predominate, the scope of legislation is consequently reduced. Therefore, in the "contractual model" the distinction between formal and informal contracts is less important than the differences settled by unionized and non-unionized conditions  see Noronha 2000b). AMADEO, E. & CAMARGO, J. M. (1996), "Instituições e o mercado de trabalho no Brasil", in J. M. Camargo (org. ), Flexibilidade do mercado de trabalho no Brasil, Rio de Janeiro, Editora Getúlio Vargas, pp. 47-94. BARBIER, J.-C. (2002), "A survey on the use of the term precarité in French economics and sociology". Document de Travail ­ CNRS/Centre d'étude de emploi, vol. 19, p. 37. CACCIAMALLI, M. C. (1983), Setor informal e as formas de participação da produção. São Paulo, IPE/USP. CAMARGO, J. M. & AMADEO, E. (1993), "Labour legislation and institutional aspects of the Brazilian Labour Market, in ILO e IIEL (eds. ), Reestruturación y regulación institucional del mercado de trabajo en América Latina, Genbra/Buenos Aires, ILO ­ Organizacion Internacional del Trabajo/IIEL- Instituto Internacional de Estudios Laborales (serie de Investigación 98). CASTEL, R. (1998), As metamorfoses da questão social: uma crônica do salário. Petrópolis, Vozes. CEBRAP; C.B.D.A.E.P. & DESEP-CUT (eds.). (1994), "Reestruturação produtiva e novos padrões nas relações capital vs.trabalho". São Paulo, Cebrap, Cadernos de Pesquisa. DEDECCA, C. S. (1996), "Desregulação e desemprego no capitalismo avançado". São Paulo em Perspectiva, 10 (1): 13-20. DIMAGGIO, P. & POWELL, W. W. (1991), "Introduction", in P. Dimaggio e W. W. Powell (eds. ), The new institutionalism in organizational analysis, Chicago, University of Chicago Press, pp. 1-38. ELSTER, J. (1989), The cement of society: a study of social order. Cambridge, Cambridge University Press. GEREFFI, G. (1995), "Global production systems and third world development", in B. Stallings (ed. ), Global change, regional response: the new international context of development, Cambridge, Cambridge University Press, pp. 100-142. GIDDENS, A. (1990), As conseqüências da modernidade. São Paulo, Edusp. GRUN, R. (2000), "Em busca da nova pequena burguesia brasileira". Dados, 43 (2): 345-372. GUIMARÃES, N. A. & MARTIN, S. (eds.). (2001), Competitividade e desenvolvimento: atores e instituições locais. São Paulo, Senaced. HARDING, P. & JENKINS, R. (1989), The myth of the hidden economy: towards a new understanding of informal economic activity. Milton Keynes, Open University Press. HOFFMANN, H. (1980), Desemprego e sub-emprego no Brasil. São Paulo, Ática. INTERNATIONAL Labour Office. (2002), Decent work and the informal economy. Geneva, ILO. JATOBA, J. A. (1990), "Pesquisa sobre mercado de trabalho na América Latina: o estado das artes". Literatura Econômica, 12: 3-106. KERR, C. & STAUDOHAR, P. (eds.). (1996), Labor economics and industrial relations: market and institutions. Cambridge, Massachusetts, Harvard University Press. LAMOUNIER, V. L. (1988), Da escravidão ao trabalho livre: a lei de locação de serviços de 1879. Campinas, Papirus. MALLOY, J. (1993), "Política econômica e o problema da governabilidade democrática nos Andes Centrais", in L. Sola (org. ), Estado, mercado e democracia: política e economia separadas, Rio de Janeiro, Paz e Terra, pp. 97-126. MANNRICH, N. (1991), Inspeção do trabalho. São Paulo, LTr. MESA-LAGO, C. (1990), "Protecccion del sector informal en America Latina y el Caribe por la seguridad social o medios alternativos", in O. P.-P. M. D. Empleo (ed. ), Mas alla de la regulación: el sector informal en América Latina, Santiago, ILO, pp. 277-318. NORONHA, E. G. (2000), Entre a lei e a arbitrariedade: mercadose relações de trabalho no Brasil. São Paulo, LTr. NORONHA, E. G. O Modelo Legislado de Relações de Trabalho. Dados - Revista de Ciências Sociais, v.43, n.2, p.241-290. 2000b. PASTORE, J. (1994), Flexibilização dos mercados de trabalhoe contratação coletiva Sao Paulo, LTr. PITT, G. (1995), Employment law. Londres, Sweet & Maxwell. POLANYI, K. (1944), The great transformation: the political and economic origins of our time, Boston, Beacon Press. PORTES A. (1996), "The informal economy and its paradoxes", in N. Smelser e R. Swedberg (eds. ), The handbook of economic sociology, Princeton, Princeton University Press, pp. 403-425. RIFKIN, J. (1996), O fim dos empregos. São Paulo, Makron. SANTOS, W. G. D. (1992), Razões da desordem. Rio de Janeiro, Rocco. SCOTT, W. R. (1995), Institutions and organizations. Londres, Sage. SINGER, P. (2002), Introduçãoà economia solidária. SãoPaulo, Fundação Perseu Abramo. SUNTEIN, C. R. (1997), Free markets and social justice. Nova York/Oxford, Oxford University Press. SUPIOT, A. (ed.). (2001), Beyond employment: changes of work and the future of labour law in Europe. Oxford, Oxford University Press. TENDLER, J. (2002), "Small firms, the informal sector, and the devil's deal". IDS Bulletin, 33 (3). THELEN, K. & STEINMO, S. (1992), "Historical institutionalism in comparative politics", in S. Steinmo, K. Thelen, et al. (eds. ), Structuring politics: historical institutionalism in comparative analysis, Cambridge, Cambridge University Press. TOKMAN, V. E. (1990), "Sector informal en América Latina: de subterráneo a legal", in O. P.-P. M. D. Empleo (ed. ), Mas alla de la regulación. el sector informal en América Latina, Santiago, ILO, pp. 3-23. URIARTE, O. E. & ALVAREZ, O. H. (2001), "Apuntes sobre los questionamientos al concepto de subordinación". Revista de Direito do Trabalho, 27 (103), jul.-set.